There are easy ways to look out for yourself. Wherever we are, people want to feel safe. Many threatening situations can be diffused early if we simply empower ourselves with knowledge. Like knowing that we can avoid personal attack with the right body language. Or making pacts with our neighbors to look out for each other. Simple yet powerful solutions can help make your world a safer place. Read on. 1. Send the right message. When you walk, project confidence and calm; appear to have a destination. 2. Know the neighborhoods where you live and work. Know locations of police and fire stations, hospitals, and restaurants or stores that are open late. 1. Stick to well-traveled streets. 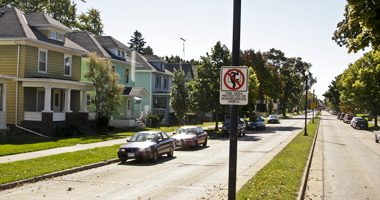 Avoid shortcuts through wooded areas, parking lots, or alleys. 2. Don't flash the cash. Money is a tempting target, so is jewelry or clothing. 3. Hold it close. Carry a purse close to your body, not by the straps. Put a wallet in an inside coat or front pants pocket, not a back pocket or side jacket pocket. 4. Bank by day. Try to use cash machines in the daytime. Have your card ready, and don't approach the machine if you're uneasy about people nearby. 5. Be fit to fly. Don't wear shoes or clothing that restrict your movements. 6. Don't fumble around. Have your car or house key in hand before you reach the door. 7. Surprise them. If you think someone is following you, switch direction or cross the street. Walk toward an open store, restaurant, or lighted house. If you're scared, yell your lungs out. 8. Leave in two's. If you work late, make sure others are in the building and ask someone - a colleague or security guard - to walk you to your car or bus stop. 1. Don't get stuck. Keep your car in good running order. Make sure there's always enough gas. 2. Windows up. Doors locked. Even if you're coming right back, roll up the windows and lock the doors. Check inside and out before getting in. 3. Be smart! Avoid parking in isolated areas. Stay aware in lots and underground parking garages. 4. Calmly lead them to the police. If you think someone is following you, don't head home. Drive to the nearest police or fire station, gas station, or other open business to get help. 5. Don't pick up hitchhikers. Don't hitchhike. 1. Use well-lighted, busy stops. 2. Don't doze or daydream. 3. Assert yourself. If someone harasses you, loudly say "Leave me alone!" If that doesn't work hit the emergency device. 4. Watch who gets off with you. If you feel uneasy, walk directly to where there are other people. 1. Don't resist. Give up property and save your life. 3. "Yes, he had an unusual tattoo--" Memorizing traits and characteristics about your attacker can help police find the person later on. 1. 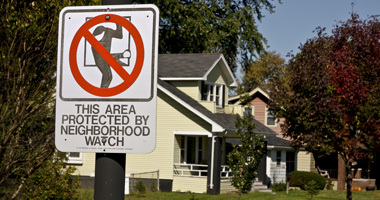 Make your neighborhood and workplace safer. Report broken street lights, clean up parks and vacant lots, and lobby local government for better lighting in public places. It's your right. Make it your obligation. 2. Be the solution. 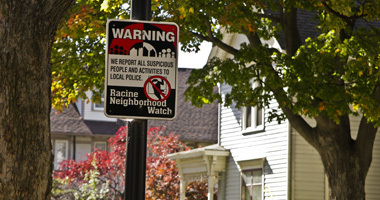 Join a Neighborhood, Apartment, or Office Watch to look out for others. 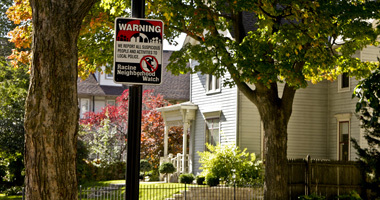 Call Racine Neighborhood Watch (262.637.5711) to find out how you can organize a neighborhood watch. 3. Do unto others. Even if it's simply calling the police on someone else's behalf, your actions can help others from becoming victims of robbery and assault. 4. Your help is the easiest thing to give. Lend a hand or an ear to a friend or co-worker who has been a victim of crime. Cook a meal, baby-sit, or call victim services or a crisis hotline. Listen, sympathize, and don't blame. 5. See the big picture. Realize that tolerance, equality, and the elimination of poverty, along with better drug treatment services, crime and drug abuse prevention education, and job and recreational opportunities for young people in your community, will make the world a better and safer place. Vote for improvements. Staying fit is important, and there's no better place to exercise than outside. Whether you run, rollerblade, walk, bike, hike, or stroll, here are safety tips that will help keep you in the prime of health. 1. Tell somebody. Let people know where you are going and when you will return. 2. "Which way did they go?" Give friends and family details on where you plan to exercise. 3. Know the terrain. Create a mental map of where public gathering spaces are located along your route. 4. Don't flaunt it. Leave jewelry and cash behind. 5. Be seen. Wear reflective material. 6. Carry ID. Carry a driver's license. If you don't have a place to carry your ID, write your name, phone number, and blood type on the inside of your athletic shoe. Include medical information. 1. Tell somebody. Let people know where you are going and when you will return. Tell a family member or friend where you are going and the time you expect to be back. 2. Stay alert. The more aware you are, the less vulnerable you are. 3. Run together. Run or walk with a partner or with a dog. 4. Don't wear headphones. Listen to your surroundings instead for approaching cars or potential attackers. 5. Exercise in familiar territory. Know which businesses or stores are open. Vary your route. 6. Run where it's clear and the light is good. Avoid unpopulated areas, deserted streets, and unfrequented trails. Avoid poorly lighted areas at night. 7. Run clear of parked cars or bushes. 8. Run against traffic. This is the best way to observe oncoming automobiles. 9. "Sticks and stones--" Ignore verbal harassment. 10. Carry a lifeline. A cell phone is your best friend in an emergency. 11. Be observant and don't avert your eyes, but keep your distance and keep moving. 12. Trust your instincts. Your intuition about a person or an area happens for a reason. Avoid areas you feel unsure about. 13. Answer from a distance. Be careful if anyone in a car asks you for directions. If you feel safe enough to answer, keep more than a full arm-length away from the car. 14. Surprise is on your side. If you think you're being followed, change direction and head for open stores and where there are other people who can help you. 15. Don't fumble around. Have your door key ready before you reach your home. 16. Call a cop. If something happens to you or someone else, or you notice anyone out of the ordinary, call the police. Your local authorities are also a great resource for finding out about criminal activity in the area where you plan to go. Getting in the zone doesn't mean zoning out. Sometimes runners and walkers get so focused they lose track of what's going on around them. This can make them more vulnerable to attacks. If you get bored running without music, practice a useful game of memorizing characteristics of strangers and license plates. 1. Be seen. Think about where you are going and how well lighted it may or may not be. Wear reflective material. 2. Stay out of the shadows. Dawn and dusk offer darkness for muggers and other crooks. 3. Watch the road. Wet or icy spots are harder to see in the dark. 1. Ask. 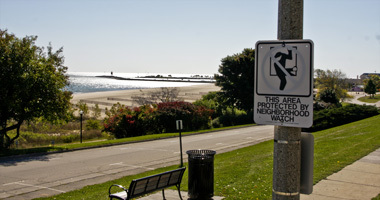 Check with the concierge for safe exercise routes. See if the hotel can arrange access to a health club or gym. 2. Know your route well. Get a map and study it. 3. "Where are you staying?" Remember the street address of the hotel. Carry your hotel's business card along with personal identification. 4. Let them help. Leave your room key with the front desk. Let them know you are out. 5. Plan for many happy returns. Being smart and careful can make your next trip much safer. Take care of the details. Pay your bills and take care of your pets. Pack enough pills. Take enough prescription medicine to get you there and back. Have a friend house-sit. Give house keys to close friends and have them watch your house while you are gone. Up, up and away--Garage doors have been known to open on their own. Unplug yours. Hold the mail. Get someone to collect your mail or ask the post office to hold it. No news is good news. Tell newspapers or magazines to hold delivery. One more time--Check mail and phone messages just before you go. Turn it off! So that there is something left to return to, turn off your electric appliances and stove. "Hello, we can't come to the phone right now--" Forward your phone to a friend so that someone will seem to be home. Have someone regularly check your messages. Tell someone where you are going. Make sure a close family member has your itinerary and phone number. Add some mystery. Remove anything with your name and address from your car before you park at the airport. Don't get caught off guard. Make note of the times of sunrise and sunset and avoid being out alone at night. Don't flaunt it. Avoid being conspicuous. No jewelry. Robbers will not know the difference between real and fake, until it is too late. With this ring, I thee ward off. The exception to the jewelry rule is to wear a simple wedding band. Be confident. Be smart. Travel well-trafficked, crowded streets. Walk like you are part of the crowd. Protect your cash. Wear a money belt. Keep your eyes peeled. Know where your valuables are at all times. When you need to go--Take your purse with you. Ask questions. Ask an employee at the airport for more information about the safety of your destination. Be aware of your surroundings. Look and act as though you know where you are headed. Women will help women. Ask for directions from families or women with children. Surprise them. If a car is following you, turn quickly and walk the opposite way. There's safety in numbers. 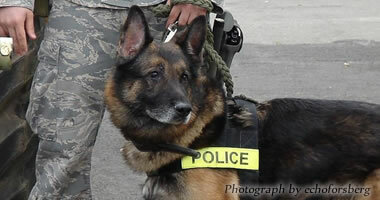 If you feel you are being followed, immediately go into a store and wait to see him or her pass. Ask a person in the store to walk out with you to make sure the person is gone. Avoid a foreign cutpurse--On sidewalks, keep your handbag and other valuables away from street side. On escalators, keep your handbag away from the opposite ramp. Park in the light. When driving look for a parking lot that is well lit and secure. Keep them guessing. If you take a cab, carry a cell phone and call your room number. Pretend you are talking to someone and announce that you will be arriving in ten or fifteen minutes. Mention the cab number. Speed dial. Carry a cell phone. Put the local police on speed dial. Surround yourself with noise and lights. A personal alarm, whistle, and a small flashlight are good ways to frighten attackers. Ah, the pleasures of trips, kids and cars. While they still always ask, "Are we there yet? ", here are some tips for safer and more relaxing car trips with children. Be ready for anything. Make sure your vehicle is maintained. Make sure you have all your insurance information. Carry a good map. Bring some pillows. Join a roadside assistance program. Don't get stuck. Carry a cell phone and make sure the battery is charged. While they sleep, drive. Driving while the kids are asleep will make road travel go more by less stressfully. Pack snacks. Pack food and water for the long ride. Eat before you hit the road. Carry the essentials. Flashlight, first aid kit, umbrella and jumper cables. Bring what baby needs. And then some. Pack plenty of diapers and formula. "Are we there yet?" The timeless car question. The timeless car answer: toys, music and books will help keep your children happy. Internet safety: Review internet expectations with your children while they are home on break. If your family is going on vacation, remind your children not to broadcast that information over social media – identity thieves could use the details of your vacation plans to develop a situation-specific scam that aims to access your personal information. Help your children adjust the privacy settings on their accounts to only allow access to friends and family. Complete regular security updates on your firewall, operating system and antivirus and anti-malware software. Online shopping: If you use a smartphone, tablet or laptop to shop online, refrain from purchasing unless you are at home or on a secure Wi-Fi network. Identity thieves can easily hack into public Wi-Fi networks and steal your personal information while you complete your transactions. Look for a padlock or key icon in the address bar of the store’s website – this indicates that the site is encrypted. Scammers often create fake websites to tempt shoppers in with great deals in order to infect their computers with malware and collect personal information and credit card numbers, so closely check the URL to make sure a site is legitimate before entering any sensitive information. Watch for skimmers: Be on the lookout for skimming devices overlaid on card readers or at ATMs. Skimmers copy the information right off of your credit card, allowing ID thieves to replicate your card and make unauthorized purchases. Check your bank statements: Regularly checking your bank and credit card statements is always a good practice. It is important to check your bank statements to verify that all purchases belong to you. Also, alert your financial institution of any vacation plans your family may have. Placing travel alerts on your accounts prevents the bank from putting a Block on your account and provides added security while you travel. Put your mail on hold: If your family is out of town, place a vacation hold on your mail with the post office while you are away. Mail theft is a common tactic among identity thieves. A mail hold will limit access to the personally identifiable information that would otherwise be piling up in your mailbox. Holiday scams: Watch out for great holiday deals that lure you in with low prices. Research the merchant online before providing any personal information. Beware of bogus shipping notices. ID thieves often send out fake shipping alert emails that are designed to look like they came from FedEx, USPS or UPS – clicking any links in these emails can lead you to a phishing website. Only use the tracking number provided to you upon initial purchase. Fraudulent gift cards promoted via social media, email or second-hand sellers are another form of phishing “clickbait.” The scammer will take your money while you are left with a gift card that is counterfeit, fraudulent or drained of value. Only buy gift cards directly from the retailer or authorized merchant and don’t click on links advertising free gift cards. Digital greeting cards can be packed with malware, so don’t simply click on links for e-cards. Rather, verify the legitimacy with the sender or go directly to the greeting card company site. For more information on how to prevent identity theft, visit the Office of Privacy Protection or call 1-800-422-7128.